When the power is out it’s easy to feel cut off from the outside world. In these modern times we are used to being in touch all the time. Cell phones, Blackberries, the Internet, radio, television; we have to stay connected all the time or we start to feel a sense of panic. I’ve seen this in my own kids and you’ve probably seen it with kids and adults also. They actually start having a physical reaction, kin to a panic attack, when they can’t communicate. Well, that’s a bit much in my book; a little too much dependence on communication technology; but there are times when it’s nice to be able to know what’s going on. For example, when the power is out and you’d really like to know if a tornado is headed in your direction. As with most other things, I try to have communications equipment that will deal with different levels of crisis; anything from a simple power outage to a full blown national emergency. When the power goes out, the phone lines are often still in service. I guess this is because a lot of phone lines are underground. Notice that I said that the phone lines are still in service. I learned the hard way that if you have a nice cordless phone/answering machine you will not be able to use it when the electricity goes out. I guess it should have been pretty obvious since you have to plug it into the wall, but I didn’t even think about it until the power went off and I tried to call the power company to report it. Guess what – – – Dead Phone! The next day I went out and bought a phone that just plugs into one of my phone jacks; no bells or whistles. Now when the power goes out I have at least one phone that usually still works. when the power is out. Of course everyone in the world, except me, has a cell phone. My wife has one, and each of my kids have one. They are really quiet handy; I’ve just never gotten into the habit. There are two main problems with cell phones. For one thing, they depend on a functioning cell tower to relay their signal, for another thing they depend on a charged battery in order to send a signal. A day or maybe two is about the limit on a cell phone battery without being recharged, but how do you recharge your cell phone if the power is out? There are several options for recharging cell phones. One of the easiest is to charge them up when you have your home generator running. In a recent 5-day power outage I ran my generator for about 4 hours a day to keep food from spoiling in my refrigerator and freezer. It didn’t really add any strain to the system to go ahead and charge my wife’s cell phone and laptop as well as our rechargeable flashlights. I wouldn’t run the generator just to charge these items, but since it was running anyway, why not take advantage of the available power. Another way I can charge a cell phone is by using my hand cranked radio (see more about this radio below). The radio that I use has a USB port on the back. All you need is a short length of wire with a male USB plug on one end and a male fitting for your cell phone on the other end. Plug the cell phone into the radio, turn the generator crank, and presto, you’re charging your cell phone. If it’s an emergency and you don’t have time to wait for the phone to charge, you can have someone crank the generator handle while you talk on the phone. 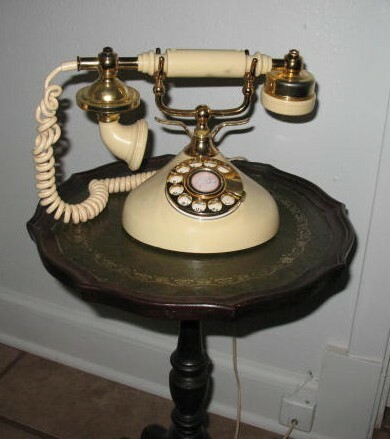 It works kind of like the old army field telephones. There are several different kinds of solar cell phone rechargers available on the market today. I may get one of these, but I don’t have one right now. Of course if you use one of these devises it has to be daytime, the weather has to be clear, and you have to have some patience. They do not recharge a phone very fast. I will probably end up installing a large solar panel that is dedicated to recharging cell phones, walkie-talkies, laptops, flashlights, and etc; but this will be later on. I have other things to do that I consider more of a priority. 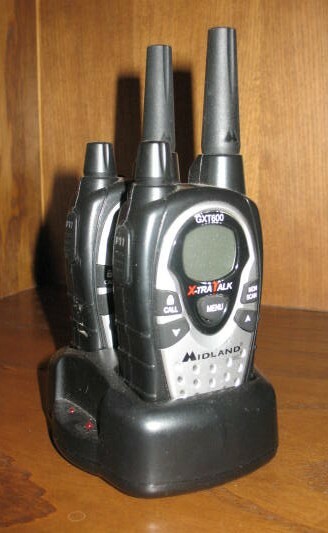 A big advantage of radios over cell phones is that you don’t have to depend on any outside infrastructure. No matter what’s happened to the rest of the world, if I have a charged up radio and you have a charged up radio and we’re within range of each other, we can talk. Range is the main problem. A good CB base station radio with a 15′ antenna will have a maximum range of 10 to 12 miles. A good handheld CB (walkie-talkie) will have a range of about a mile. I know that it says different on the box; I’m just telling you what I have experienced. With that said, CBs are still very handy. We can communicate with people at farms throughout our neighborhood on CB. When one of the family goes out in the woods, they always take a CB. And to tell you the truth, if there’s some kind of major social breakdown I don’t plan to travel more than ten miles from the farm anyway. Shortwave radio is very different from CB. The range is phenomenal. If you catch a signal on what’s called “the skip” you may find yourself listening to broadcasts from England, Egypt, or anyplace else in the world. Most people think that you have to have a special license to have a shortwave radio. This is only true if you want to broadcast on shortwave. Anyone can buy a shortwave receiver, and they are surprisingly inexpensive. My wife bought me one for a birthday present from Radio Shack. This is a great little radio. It has AM and FM bands, and two shortwave bands. You can plug it into the wall, put regular batteries in it, run it on the rechargable ni-cad batteries that it comes with, or run it by cranking the generator handle on the side. Cranking the generator will actually recharge the ni-cad batteries; and, as mentioned above, you can plug your cell phone into it and use the generator handle to recharge your phone. The generator handle does not seem flimsy. The whole radio seems to be well built, and the reception is good. You can use the built in extendable antenna, or hook up an exterior antenna to improve range and reception. About the only draw-back is that it doesn’t have a weather band, but I am told that similar radios are available that do have weather band. This doesn’t really bother me because I have weather band on my walkie-talkies. The Radio Shack radio that I have costs under $40; quiet a bargain. By the way, it also has a built in flashlight that works off of the same rechargeable batteries. 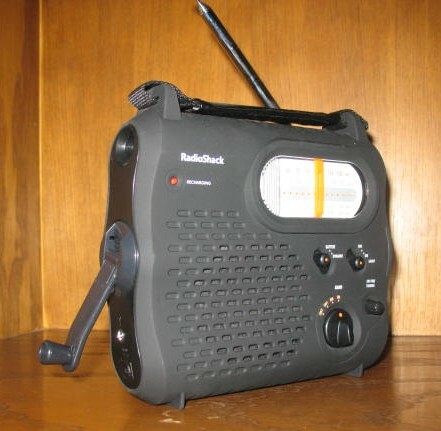 I would highly recommend that you get one of these radios for you emergency kit. If you are interested in broadcasting on short wave, you should get in touch with you local HAM operators club. They have information on testing and licensing, and they can set you up with a sponsor that will guide you through the process. People were able to have local communication long before the invention of the telephone or radio. In colonial America, the tolling church bell was used to call settlers in from their farms to fort up in the local blockhouse during Indian raids. We have a kind of informal communication network in our rural community using car horns. Three evenly spaced honks repeated over and over is a call for help. Even better than a car horn is one of those portable air horns, the kind that they use to start boat races or that some people take to football games. You can hear those things for a couple of miles. When I was a kid, mama had a big “U” shaped piece of iron hanging from a cord on the back porch. I think it was some kind of part off of an old disc plow. Hanging next to it she had an iron bar. When it was time for us kids to come in she would take the iron bar and beat on that old plow part. We could hear it all over the farm, and we knew it was time to come in. Imaginative people can always find a way to communicate.